A story about friendship born of divine intervention, bravery among women and a wedding dress that bears witness to their futures. Five Brides by Eva Marie Everson is a enchanting tale that will capture the reader from start to finish. Already a fan of Ms. Everson, I can say this book is no exception to her charming talents as a writer. Betty Estes refuses to be live life in status quo. Headstrong and beautiful, she promotes sophistication and grace every where she goes. Although her family is determined to steer her in the direction that they want for her life, Betty’s strength and fortitude help her to walk the path God has paved for her and the love He intended. Joan Hunt has ventured from her homeland to Chicago to find a way to help her family in England. The war has devastated England and she is determined to utilize her talents and abilities to help those she loves. She is not interested in being Mrs. Anyone, but she’s got a knack for matchmaking. Determined and unwavering, Joan will do whatever she sets her mind to do. Magda and Inga Christenson have decided to venture out on their own, away from their family’s strong religious convictions and restrictions. Magda lives in the shadow of her sister but she longs to write, Inga is stunning and finds a job as a stewardess. Always more outgoing, Inga goes for what she wants while Magda is content not to rock the boat. Both find themselves on the opposite side of their original intentions for better or for worse. Evelyn Alexander wants something more than a simple life in the south. Encouraged by her pen pal, Joan, she ventures to Chicago to find adventure and the something more she’s been looking for. Evelyn also longs for true love and when she thinks she’s found it, she will not be deterred, even against the wishes of those who love her most. Five women so different and yet so much alike, become roommates and friends. They share their dreams, the failures and their wish to wear a beautiful wedding dress someday. Putting the cart before the horse, they take their destinies into their own hands and make a pact to share this incredible dress, whenever the day arises. 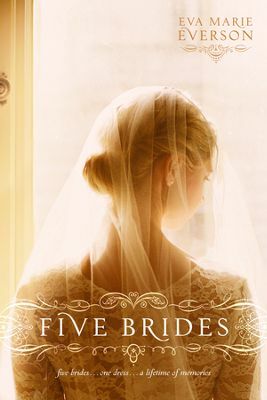 Five Brides is a wonderful book that will leave the reader with that feeling of contentment in having spent their time reading a beautiful story. I received an advanced reader copy of this book from Edelweiss Above the Treeline and Tyndale House Publishers in exchange for my honest opinion which I’ve provided here.